You’ve heard of “regulatory capture,” right? This is the phenomenon in which interest groups end up running the government agencies originally designed to rein them in. So farm interests dominate the USDA, Wall Street interests dominate the SEC, corporations dominate the NLRB, etc. The Federal Reserve’s Board of Governors employs 220 PhD economists and a host of researchers and support staff, according to a Fed spokeswoman. The 12 regional banks employ scores more. ….It’s fair to [estimate] that there are something like 1,000 to 1,500 monetary economists working across the country. Add up the 220 economist jobs at the Board of Governors along with regional bank hires and contracted economists, and the Fed employs or contracts with easily 500 economists at any given time. Add in those who have previously worked for the Fed — or who hope to one day soon — and you’ve accounted for a very significant majority of the field. 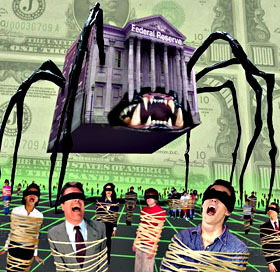 ….Affiliations with the Fed have become the oxygen of academic life for monetary economists. “It’s very important, if you are tenure track and don’t have tenure, to show that you are valued by the Federal Reserve,” says Jane D’Arista, a Fed critic and an economist with the Political Economy Research Institute at the University of Massachusetts, Amherst. ….The Fed [also] keeps many of the influential editors of prominent academic journals on its payroll. It is common for a journal editor to review submissions dealing with Fed policy while also taking the bank’s money. A HuffPost review of seven top journals found that 84 of the 190 editorial board members were affiliated with the Federal Reserve in one way or another. “Try to publish an article critical of the Fed with an editor who works for the Fed,” says [Jamie] Galbraith. And the journals, in turn, determine which economists get tenure and what ideas are considered respectable. Read the whole thing. Even Paul Krugman gets into the act, claiming that ever since he began criticizing Alan Greenspan a few years ago, he’s been blackballed from the Fed’s annual Jackson Hole get-together of everyone who’s anyone. Overall, though, this is more a sociological critique than a claim that the Fed uses its raw power to stifle dissent. Rather, you pull your punches a bit knowing that the editor of the journal you’re submitting to used to work for Greenspan. You dial it down a notch because someday you might want a job at the Fed yourself. You stay within the mainstream because that’s the safest place to be when upwards of half your profession depends on the largesse of the Fed to feed their families. Is this true? I don’t know, but it certainly sounds plausible — and the circle of monetary economists really is startlingly small. And from a journalistic point of view, the great thing about this story is that it’s nonfalsifiable: the more economists who pooh pooh your theory, the more proof you have that they’ve all been captured by the Fed. And you have to admit, it sure explains a lot about what happened over the past decade or so. Did 98% of the profession really believe that there was no housing bubble in 2004? Or did they just decide that staying quiet was a better career move? The latter seems rather more likely, doesn’t it?